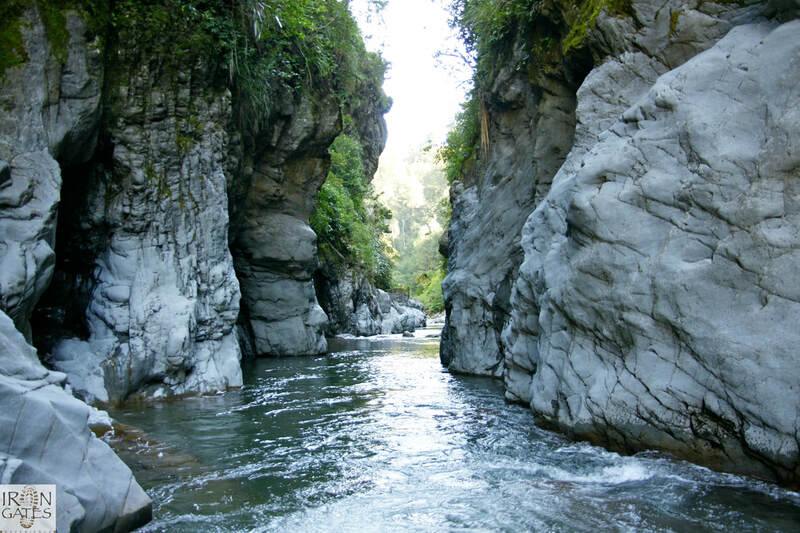 Iron Gates Gorge is a narrow chasm where the Oroua River squeezes between the walls of sheer-sided cliffs as it leaves behind its remote backcountry headwaters and spills into farmland on its way to the sea. Its name reflects the barrier presented by the narrow gorge that guards the entrance to the valley. Located about 90-minutes from the road end, the Iron Gates Gorge provides a comfortable day walk for those wanting to enjoy a mix of easy bush and river. 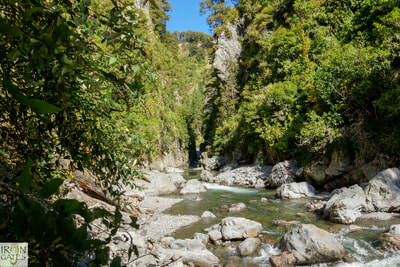 To get to the beginning of the walk, it's just over an hour's drive from Palmerston North. 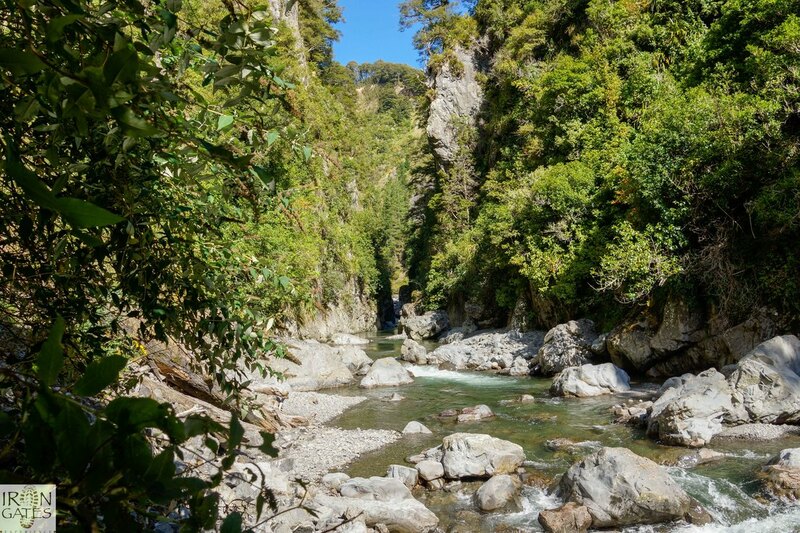 Not only does the walk offer a mix of terrain, it also provides a true wilderness experience, as once the Oroua River valley is reached, all that can be seen are the high peaks and forest that enclose the valley, despite being only a short distance from the car park and farmland. The track to the gorge leaves from the car park at the end of Petersen’s Road where, on fine days, there are sweeping views across to Mt Taranaki and the volcanoes of the central plateau. Crossing the fence at the car park, the track follows an old logging road through farmland to the forest park boundary, and then on to the footbridge over the Umutoi (South Branch) stream before gently climbing to a low saddle between the stream and the Oroua River. The wooden footbridge over the stream was built by the New Zealand Army Engineers in 1980 and replaces the earlier wire and mesh swing bridge that challenged many people on this otherwise family-friendly walk. From just below the low saddle between the two valleys walkers have the option of making a short detour to visit Alice Nash Memorial Heritage Lodge, which opened in 2007 following the disastrous fire which razed the old lodge to the ground. A high level flood-track from the lodge leads to Iron Gate(s) Hut some three to five hours distance, while another track leads to the Ngamoko Range via the Tunipo summit track, which at 1568m rises above the lodge and car park and provides unsurpassed views of the Manawatu and into Hawke’s Bay. From the low saddle the track continues to follow the old logging track gently downhill towards the river through a series of gentle zig-zags until it abruptly stops and becomes a more familiar tramping track a few hundred meters from the river. The spot where the track meets the river is a well-used campsite and, with a small glade of alrge trees, makes an ideal place to stop and enjoy the experience of bush and river. After the track ends at the river, the route follows the river downstream to the Iron Gates Gorge with several river crossings required before the gorge is reached about another fourty minutes or so. The river in this lower section is usually easily crossed, although there is one deep pool that has a side track to avoid a swim. As with all back-country rivers care is needed. The entrance to the gorge is quite daunting with the river suddenly dropping into the narrow opening and the high sides rising sharply from the river bed. On seeing the sheer-sided gorge it is easy to imagine how it came to be named, given the barrier that it posed for early explorers trying to enter the valley by following the river up from the farmland below. 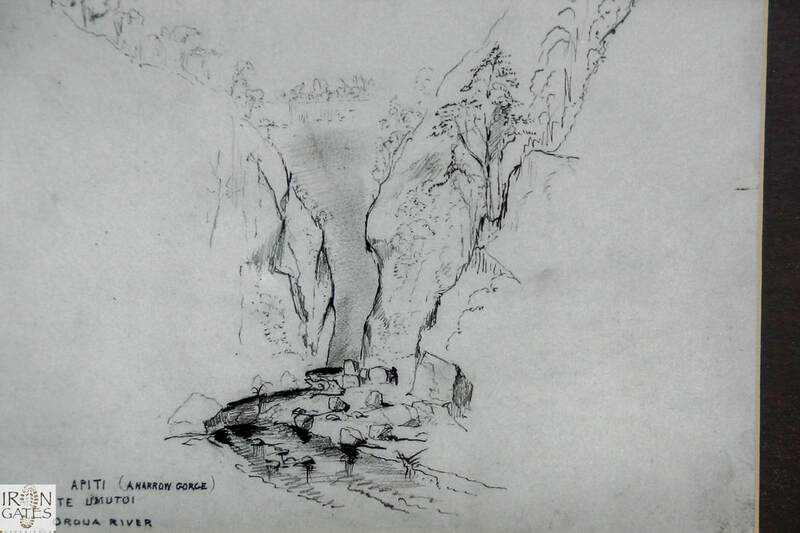 The return journey offers a different perspective on the river and surrounding peaks and the more adventurous may choose to go further up the valley, perhaps as far as Iron Gates Hut, which despite sharing the same name as the gorge, is located some three to five hours tramp away. Trout fishing and hunting are also attractions of the Oroua River valley, and for the very hardy, a swim is always possible, although the water is always cool, even in the summer. Access: From a car park at the end of Petersen’s Road, which turns left off the Table Flat Road, just beyond the village of Apiti, about one hour from Feilding. Time: Fifty minutes from the car park to the Oroua River and another 40 minutes down river to the gorge.